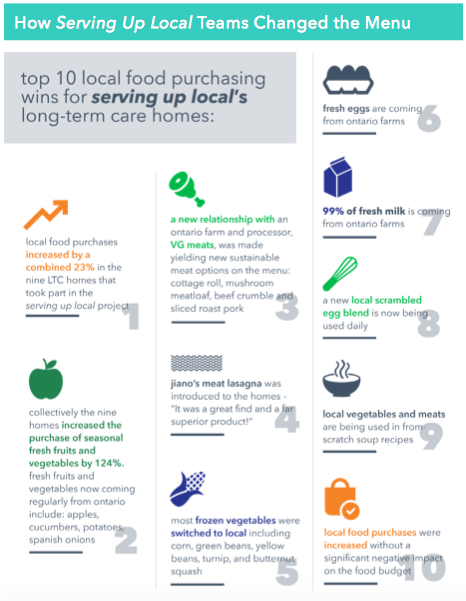 The Golden Horseshoe Food and Farming Alliance is thrilled to share that our Serving Up Local project with nine municipally-run long-term care (LTC) homes in Durham Region, Halton Region, and the City of Hamilton increased local food procurement by a combined 23% in 2017, far surpassing the project goal of increasing local food purchases by 5%. We now have a number of communication pieces and resources to share, including a manual, that are now uploaded on our website. As we build upon this project with a food literacy training initiative, we wanted to share some of the exciting successes from the procurement part of the project, which ultimately got LTC residents eating and enjoying more local, nutritious food, while simultaneously supporting local producers. 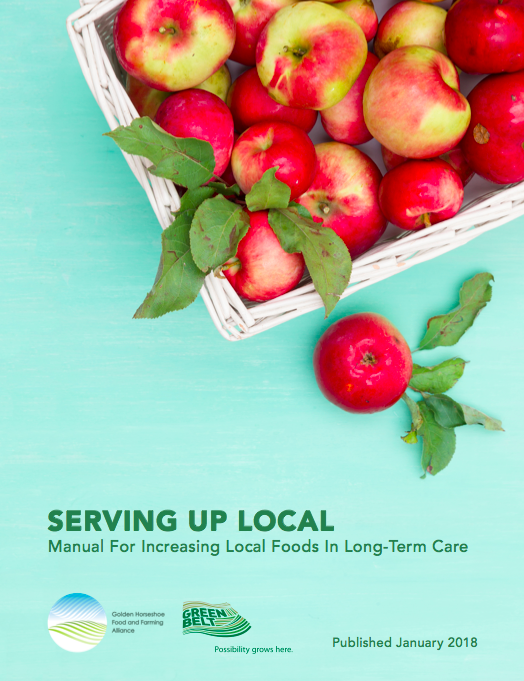 Collectively the 9 long-term care homes in Hamilton, Halton and Durham increased their seasonal fresh fruit and vegetable purchases (with a focus on strawberries, asparagus, corn on the cob, peaches, tomatoes) by an extraordinary 124%. The project also saw success in pioneering local food language in procurement documents for food products in long-term care. As part of the project, the GHFFA also administered a survey to 103 residents and their family members at six of the homes taking part in the project. Indicating even further benefit, 71% said they felt better about the food served when they knew it was sourced locally from Ontario. Long-term care has one of the lowest fixed food budgets in the broader public sector. Thus, what can be accomplished in the long-term care sector has the potential to demonstrate what is certainly possible in other sectors with greater budget flexibility. Thanks to the Greenbelt Fund, our vigorous partners in Durham, Halton and Hamilton, and the Serving Up Local team. We are very proud of this project’s success, and have already begun building upon it with the Serving Up Local food literacy training project in Halton Region LTC homes. Stay tuned for more!